Most of our Keeper Bulls (bulls kept for development of the ALC herd) are born in the first two months of calving, always from genetics of sires and dams with outstanding calving intervals and rapid rebreed. Do-ability – The ability to gain weight on good nutrition but of equal importance to not lose weight on poor nutrition. 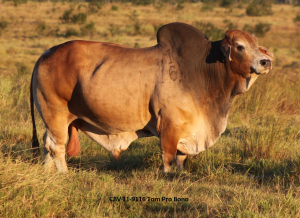 Early puberty – Yearling bulls are measured monthly at ALC for testicle diameters as well as body weight, to 600 days of age, to determine those potential sires with genetic trend to reach sexual maturity early, on low nutrition, and often at low body weights. Speed of Rebreed for generations of females behind the bull – As a result the ‘Days to Calving’ analysis for the Brahman breed shows a favourable trend for ALC. Speed of Growth – Not raw size. All this data is available to our clients on our Bull Data Sheets on selection day and Bull Sale days to aid our judgement. ALC never starts with a number of bulls as the selection target. In some years we have higher or lower mating success. Consequently we select and categorise keepers and sale bulls into price groups related to commercial beef earning capacity. Castration rate is quite severe as we also value good steers. ALC cattle are not treated for ticks, worms, or flies. ALC operates commercial beef herds, both breeding and finishing stock. It is with our commercial herd in mind, that we make our selection on bulls.